Info In November 1998, Tammy Baldwin was elected to Congress -- the first woman to serve in the House of Representatives from Wisconsin. She was re-elected in 2000 and 2002. Congresswoman Baldwin serves on the House Budget and Judiciary Committees. She is a leading advocate for health care reform, preserving and protecting Social Security and Medicare, and increased support for public education, including financial aid for higher education. Tammy Baldwin is a forceful supporter of civil rights and an advocate for those in our society whose voices, too often, are not heard. In the 108th Congress, Tammy Baldwin is dedicated to enacting laws that will benefit her constituents in Wisconsin. She is committed to reducing the high price of prescription drugs for seniors and creating a prescription drug benefit under Medicare, providing assistance and support to our nation?s veterans, protecting our environment and creating a balanced national energy plan, guaranteeing small class sizes with enough teachers for our children, and ensuring fairness for Wisconsin?s farmers. Tammy Baldwin began her career in elective office as a member of the Dane County Board of Supervisors in 1986. In the same year, she served briefly on the Madison, WI City Council, filling an aldermanic vacancy. Baldwin served four terms as a Dane County Supervisor (1986-1994), while also running for, and winning, a seat in the Wisconsin State Assembly in November 1992. She served as a State Representative for the 78th Assembly District (comprising central and south Madison) from January 1993 to January 1999. Baldwin?s Congressional campaigns have been lauded for their high voter turnout, especially among young adults and college students on the University of Wisconsin-Madison campus. 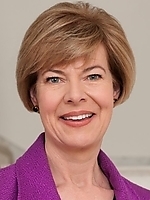 Tammy Baldwin was born in Wisconsin?s Second Congressional District. Raised there jointly by her mother and her maternal grandparents, Baldwin graduated first in her class of 510 students at Madison West High School in 1980. She received an A.B. degree from Smith College in Northampton, Massachusetts in 1984 with majors in government and mathematics. In 1989, while an active member of the Dane County Board of Supervisors, Baldwin earned her J.D. from the University of Wisconsin Law School and practiced law from 1989-1992. My very first taste of the impact public service can have on people's lives came, surprisingly enough, when I was in middle school in Madison. I attended Van Hise on the west side, which is now Velma Hamilton Middle School. As a member of the student council, I remember working on issues both small and big, local and international. Our School-Community Relations Committee helped address the concerns of people who lived right across the street from the school. Our student council also raised money for a school in Managua, Nicaragua (Wisconsin's sister state) after a devastating earthquake. I learned that the actions of a small group of people could make a meaningful difference in the lives of others. Our small group of 6th, 7th and 8th graders took on problems that many people either ignored, or just thought, "let it be, we can't change anything... no use trying." Our small group was hopeful...we DID try. I served on an outreach committee to improve relations with neighbors of the school. One woman who lived near the school was upset because students trampled on her flowers walking to and from school. Another was quite angry about a noisy air exchanger in the industrial arts classroom. We solved these problems by putting up a small fence around the flower beds and lobbying the school board for a muffler for the air exchanger. This was a great exercise in problem-solving and in seeing how a small group of people can effect positive change. I really loved the experience and it put me on the career path I'm following to this day. Right after college, I returned to Madison and got an internship in the office of then WI Governor Tony Earl. I was assigned to work with the Governor's advisor on women's issues. We were advancing Governor Earl's initiative on pay equity. I was an enthusiastic young woman and, no doubt, to channel some of my energy out of the office, I was asked to monitor meetings of all sorts - city council meetings, county board meetings, committee meetings, and the like. By attending all of these meetings, watching and listening to the proceedings over a period of time, I came to understand the political process. It was de-mystified for me. What had previously seemed so complicated was now understandable and I gradually began to think, "Hey, I can do that!" Everyone knows I was a member of the Wisconsin State Legislature for 6 years and am now the first woman from the state of Wisconsin elected to Congress. But let me let you in on a little secret...In 1975, I ran for Student Council President at my middle school...AND LOST. In 1980, I competed for a chance to be my high school graduation speaker...AND LOST. And in 1983, I ran for class president at my college...AND LOST! I hope that's a lesson for other people (young and older) who are dreaming big dreams!